What comes to your mind when I say "cutting onions"? That's right! All you can think of is tears, burning eyes and a running nose. Cutting onions may seem like the most painful part of cooking but not anymore! When you cut onions, the cells break and release their contents. The enzymes in the onions are now free to mix with sulfenic acid to produce propanethiol S-oxide. Tears are caused by propanethiol S-oxide which is a volatile sulfur compound that wafts towards your eyes. This gas reacts with the water in your tears to form sulfuric acid which burns and stimulates the production of more tears to wash away the irritant. 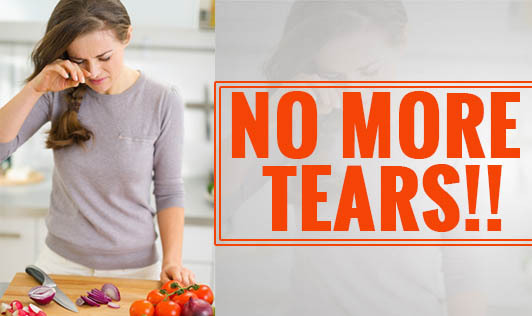 Here are a few tips to avoid those painful tears while cutting onions! • Avoid cutting the root of onions till the end as the enzymes and acids are concentrated there. • Use a sharp knife to avoid crushing the onion cells and to release fewer enzymes. • Place a candle in front of the cutting board. The flame will draw the gas released by the onion. • Soak onions in water before cutting as it denatures the enzyme. • Freezing onions will help in reducing the amount of acid enzyme released. Freeze the onions for 15-20 minutes before cutting. • Wear contact lenses. This will prevent the gases from coming in contact with your eyes. • Cut onions under water or under a tap of running water. • Wear goggles! This may seems really stupid while working in the kitchen but it does help! • Chew on bread or gum while cutting. Try these simple tricks the next time you are cutting onions and let us know which one worked best for you! If you have any more ideas, let us know by leaving a comment!